Throughout the summer of 2018, CFE faculty mentors are worked with undergraduate Plymouth State students in extracurricular field- and lab-based environmental research projects spanning watershed ecosystems. This program, called Advancing Undergraduate Environmental Research (AUGER), is an extracurricular initiative of the Center for the Environment to engage and educate undergraduates in the what, how, and why of environmental research. Below is a summary of the projects. 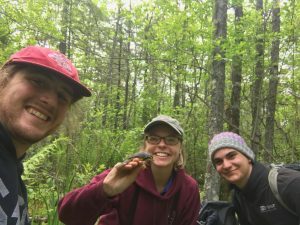 PSU students were critical players in the continuation of a long-term study of Brook trout in the Beebe River watershed. Undergraduates worked closely with new graduate students in Environmental Science & Policy and Biology to conduct a variety of field assessments related to Brook trout, benthic macroinvertebrates, and habitat condition while also installing and maintaining passive in-stream antennas to detect PIT-tagged brook trout and continuously logging water temperature, level and conductivity sensors. Dom and Alec also assisted with aging fish using scale samples in the lab. Bao led the lab-based analysis of heat shock proteins in Brook trout gill filaments. This entailed extracting total proteins and quantifying the level of expression of a stress protein (HSP70) in fish sampled from multiple sites and over the season. All three students worked side-by-side with graduate and faculty mentors and contributed to our periodic “lab” meetings when we discussed preliminary results and trends. Near the end of the summer, Bao presented preliminary results of his work at the annual NH-INBRE Conference in Bretton Woods, NH, and Dom, Alec, Josh and Tyson Morrill (M.S. Biology, expected 2019) attended the American Fisheries Society Conference in Atlantic City, NJ, where Tyson presented on his thesis research. The student research team surveyed varied habitats in the greater Plymouth area to document frog and salamander species occurrence, map vernal pool habitats, explore possible stressor and threats and sample for the presence of Chytrid fungus (Batrachochytrium dendrobatidis). The research team collected >100 DNA swab samples from ten anuran species. The field sampling provided opportunity for students to communication about scientific research with private landowners, municipal leadership and K-12 student volunteers. The field work required the team to research, refine and follow safety and decontamination protocols, and to adopt best practices for field documentation and sampling methods. Students performed lab assays to determine if the amphibians were host to the chytrid fungal pathogen. Under the mentorship of Dr. O’Donnell the research team received training and consultation on extraction of DNA from swab samples, proper archiving/storage of samples, PCR-based amplification of a chytrid-specific genetic marker from each sample, and gel electrophoresis to identify if the marker was present. Of the individuals that were sampled, thirty-seven were positive for the presence of Bd. The research team consulted with Dr. O’Donnell at length regarding interpretation of the results, and the design and direction of future work based upon their preliminary findings. Next steps include looking for patterns among the relationship of Bd presence, specific habitat features and species to identify ways that the disease is spread or other influential factors that may be protective or exacerbate risk of disease. Several researchable questions have been identified by the team. Two of the student researchers are continuing this work through Independent Undergraduate Research. During Fall 18 and Spring 19 the team is collaborating with Museum of the White Mountains with local K-12 schools to host a Local Action to Preserve Biodiversity Vernal Pools exhibit in the Silver Center. Three students, Jess Sullivan, Christopher Frignoca and Jack McCarthy, worked with Dr. Len Reitsma and MS in Biology candidate Kelsey Pangman on constant monitoring of the response of both early and later succession bird species to an experimental tree harvest in March 2012 in an American Tree Farm in Canaan, NH. Bird censuses began pre-harvest and have been repeated each after harvest. Specific species were caught and color-banded to collect data on nesting success. These species included both early and later succession species. To date, the species diversity has significantly increased through the recruitment of early succession species such as the common yellowthroat, chestnut-sided warbler and magnolia warbler among others, through the continued use of this mosaic by late succession species such as hermit thrush, ovenbird and black-throated blue warbler. The patches are sufficiently small (< 0.5 ha) to retain a majority closed canopy of mature trees but numerous enough to provide ample dense shrub growth to attract early succession species. Both suites of species have consistently been successfully fledging young. The student interns handled and banded birds, mapped territories of marked birds, verified fledging success and learned how to identify species by sound and sight while conducting point counts (censuses). 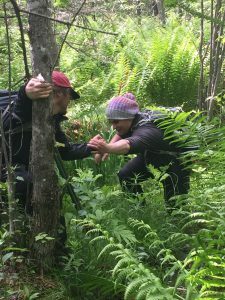 Christopher Frignoca and Jack McCarthy, BS in Environmental Biology seniors, joined Dr. Len Reitsma for the 2018 field season assessing the reproductive success of five populations of Canada warblers, a Neotropical migratory species declining at >5% annually in NH. 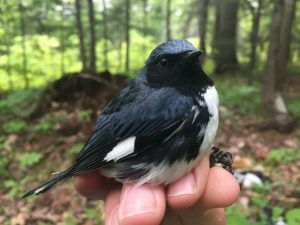 We caught and color-banded males on their territories in the early phase of the breeding period, estimated total number of breeding pairs at each of the five locations, and then returned to each site to observe parents feeding fledglings and to measure vegetation. This method is being developed as an efficient measure of breeding productivity that yields important information on demography, habitat suitability and breeding success. The field interns learned how to handle and band birds, re-sight marked birds, and conduct vegetation measurements. 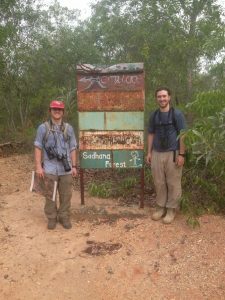 Two students (Jack McCarthy and Chris Frignoca) worked with Dr. Len Reitsma devising multiple methods of sampling fauna in non-destructive ways consistent with the philosophy of the Indian Sadhana Forest (sanctity of all life), and the students executed the inventory. The bioinventory focused mainly on bird censuses and arthropod censuses using a variety of methods that included point counts (for birds), sweep netting for flying insects, dip-netting for aquatic arthropods, and leaf counts for invertebrates on leaf surfaces. The students and Reitsma continue to work on the data they collected and will produce a report for the folks at Sadhana. This place is dedicated to reforestation and water conservation in a dry part of India. Their efforts in conserving water have made them a resource to local people and have resulted in reforestation beyond the areas planted with native species. Chris and Jack were the first to document the increase in biodiversity in a systematic way and their work is intended to be exported to two other Sadhana sites in Kenya and Haiti. Shannon Brunelle, undergraduate majoring in Environmental Science and Policy, participated with Dr. Mark Green and a team of four students. Their work focused on forest hydrometeorology at the Hubbard brook Experimental Forest. Shannon learned how to make temperature/humidity sensors, deploy them, maintain them, and process the data they produced. These were focused on understanding sub-canopy microclimate at three sites in the Hubbard Brook valley. She also helped produce a forest inventory around the eddy covariance tower at Hubbard Brook. This involved identifying and measuring the size of trees in a 200 meter radius around the tower. Shannon developed expertise in the application of stable isotopes for tracing water at Hubbard Brook. She installed and maintained collectors for precipitation, throughfall, and soil water. Shannon took responsibility for collecting the samples after each rain event this summer, and she led the analysis of the samples at the PSU Stable Water Isotope Lab. She crafted a final presentation that was contributed to the summer CFE research afternoon and she presented her isotopic work to the Meteorology REU students.